Back cover blurb: What would YOU do if your child wasn't yours? Utterly compelling, Sunday Times bestseller Adele Parks's new contemporary novel The Stranger In My Home, is sure to move, grip and delight her fans, along with readers of Liane Moriarty, Jane Shemilt and Lisa Jewell. Alison is lucky and she knows it. She has the life she always craved, including a happy home with Jeff and their brilliant, vivacious teenage daughter, Katherine - the absolute centre of Alison's world. Then a knock at the door ends life as they know it. Fifteen years ago, someone else took Alison's baby from the hospital. And now Alison is facing the unthinkable. The daughter she brought home doesn't belong to her. When you have everything you dreamed of, there is everything to lose. I honestly didn't realise how much I had missed Adele Parks' contemporary writing until I picked up The Stranger in my Home. This is a novel that I have been (im)patiently awaiting for some time. Although I love Adele's two previous historical fiction novels, it is good to have her back writing contemporary fiction - particularly when it is SO good. Alison Mitchell is lucky, lucky to have the life she has, lucky to have Jeff, and lucky to have their daughter Katherine, a bright teenager destined for great things. When a complete stranger in the form of the (very) handsome Tom Truby knocks on the door, and delivers some devastating news, the family's perfect world quickly begins to fall apart. Everything they thought they knew about their daughter is thrown into turmoil. As if that wasn't enough, Tom's visit delivers a second, equally as devastating blow, that makes the family question their future together as well as their past. Alison has had to fight in the past to get what she wants, she is no stranger to the concept, she is just a little out of practice, but her motherly instinct tells her that she needs to protect Katherine, no matter what the consequences. I don't want to say much more, as I don't want to give anything away. You MUST discover this absolute gem of a novel for yourself. I'm pretty sure I say this after every Adele novel - but The Stranger in my Home, is definitely her best yet. It had me truly gripped from start to finish, and I know it is going to fly off the shelves. 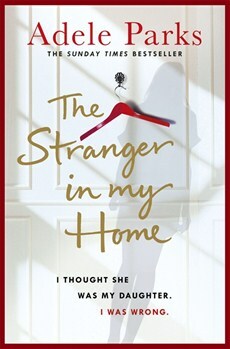 The Stranger in my Home is available now via Amazon online and other e-book retailers. The paperback is out January 2017 - you can pre-order it now via Amazon online and all good book sellers.